Biotechnology! Biotechnology! Biotechnology!!! Seems like this word has become a buzz word, nowadays. You will hear this word from classrooms to cafeterias. It can be commonly seen in newspapers, magazines, journals, and all sorts of media outlets, which include print media to electronic media. People are organizing huge meetings, conferences, and workshops on biotechnology, where participants come from different arenas like science, industry, administration, social work, and so on. As time goes by and the way our life is heading it seems as if biotechnology has become an essential component of our life. The day is not far, when we cannot fathom our life without biotechnology. If, we have to say it in simple words, it can be said that "We wake up with biotechnology and we go to bed with biotechnology". It is also possible that in future our birth and death can also be determined by biotechnology. The word 'biotechnology' has received enormous importance and significance during last two decades, which is just unprecedented. The probability and possibilities behind this kind of attention towards biotechnology may be due to its unlimited potential to serve and to benefit humanity. So far, biotechnology has touched our lives in all aspects, such as, food, health, and animal life. We have also noticed the importance and potential of biotechnology for the improvement of our environment and for better living, for example capability of biotechnology to meet the demand of depleting energy reserves of fossil fuels by replacing it with Bio-fuels, because availability of fossil-fuels are becoming limited to meet the demand of ever increasing population. In simpler terms, our life starts with biotechnologically developed toothpaste, to drive car with biotechnologically developed fuels, and we also retire for the day with bedside medicines either to keep us healthy or to control chronic diseases, like diabetes, which makes our life better. Rationally, the word 'biotechnology' has been derived from two simple terms of science, i.e., 'Biology' and 'Technology'. If we try to decipher these two words, it simply suggests, in a lay-man's language, that it is the technology which makes our life convenient and comfortable with the employment of biological resources. The question still remains, 'Is biotechnology such a new branch of science?' The fact is that biotechnology has been in practice even much before the term 'Biotechnology' was coined, itself. It is interesting to learn and understand how and when biotechnology really evolved. Biotechnology: What Does it Mean? The term biotechnology was used for the first time by Karl Erkey, a Hungarian Engineer, in 1919. Was it the start of biotechnology? The answer is no!!! Later on biotechnology was defined by different scientists. As per one definition biotechnology is, "Application of the principles of engineering and biological science to create new products from raw materials of biological origin, for example, vaccines or food." Or in other words, it can also be defined as, "the use of living organism/s or their product/s to modify or improve human health and human environment". Apart from their beneficial applications, biotechnological principles has potential for destruction too, the best example for this is 'bioterrorism'. Biotechnology from fiction, myth, and reality can be simply understood by reading the novel and watching movie "Frankenstein". In this science fiction, Frankenstein has created a human life which became a monster, this monster became the reason for the destruction of Frankenstein, the creator of human life. As we know, the technological application of biological material is considered as biotechnology. If, we want to understand how it works, then it is essential for us to know what is the starting point or material for biotechnology. In general, biotechnology uses either living material or biological products to create new products for their use in various pharmaceutical, medical, agricultural, and environmental applications, with the ultimate goal to benefit humanity, for example, production of recombinant proteins, resistant crops, vegetables, higher milk producing animals, and the list is endless. There are various stages in the development of biotechnology to meet the various needs of humans. Its development was basically based on observations, and applications of these observations to practical scenarios. The complexity of biotechnology is augmented due to evolution of new technologies with time, as these are based on the employment of improved technological advancements along with better understanding of various principles of life-science. If, we systemically study the developments of biotechnology up to its current stage, it can be divided into three different stages or categories: (1) Ancient Biotechnology, (2) Classical Biotechnology, and (3) Modern Biotechnology. Some important discoveries related to biotechnology have been shown in [Figure 1]. Most of the developments in the ancient period i.e., before the year 1800, can be termed as 'discoveries' or 'developments'. If we study all these developments, we can conclude that all these inventions were based on common observations about nature, which could be put to test for the betterment of human life at that point in time. Food, clothes, and shelter are the most important basic needs of human beings irrespective of whether they lived in the ancient period or the modern period. The only factor that has changed is their types and origins. Food has been an inevitable need since the existence of man as well as for continuous existence of human beings. Early man used to eat raw meat, whenever they found a dead animal. However, during harsh weather, there was a paucity of food, hence, as per the saying, 'necessity is the mother of all inventions', which led to the domestication of food products, which is named as 'agriculture'. In ancient times, humans explored the possibilities of making food available by growing it near their shelters, so that the basic need for food could be met easily. They brought seeds of plants (mostly grains) and sowed them near to their shelters. They understood the importance of water, light, and other requirements for the optimal growth of food plants. Similar principles and needs also led them to start domestication of different wild animals, which helped them to improve their living conditions and to satisfy their hunger. The need to hunt for animal was done away with it; as now animals were available to them at closer proximity, and also they did not have to deal with the dangerous conditions of hunting. Domestication of wild animals was the beginning of observation, implications, and applications of animal breeding. Certainly, we can say that this was the initial period of evolution of farming, which led to another needs like the development of methods for food preservation and storage. They used cold caves to preserve food for long-term storage. It also made the way for the evolution of pots to store food products, in the form of leather bags, clay jars, etc. After domestication of food crops and wild animals, man moved on to other new observations like cheese, curd, etc. Certainly, cheese can be considered as one of the first direct products (or by-product) of biotechnology, because it was prepared by adding rennet (an enzyme found in the stomach of calves) to sour milk, which is possible only by exposing milk to microbes (although this understanding was not there, at that time). Yeast is one of the oldest microbes that have been exploited by humans for their benefit. Yeast has been widely used to make bread, vinegar production, and other fermentation products, which include production of alcoholic beverages like whiskey, wine, beer, etc. Vinegar has a significant importance because of its low pH. Vinegar is capable of preventing growth of certain microbes, and therefore, vinegar can be used successfully for food preservation. The discoveries and benefits of these observations led people to work on further improvement of the process. Fermentation was a powerful tool to improve their living conditions, even though they were ignorant about the principle behind it. One of the oldest examples of crossbreeding for the benefit of humans is mule. Mule is an offspring of a male donkey and a female horse. People started using mules for transportation, carrying loads, and farming, when there were no tractors or trucks. Mule is comparatively easier to obtain than Hinny (offspring of a male horse and a female donkey). Mule and Hinny both have a chromosome number 63, unlike horse (64) and donkey (62). The second phase of evolution and development of biotechnology can be called 'Classical Biotechnology'. This phase existed from 1800 to almost the middle of the twentieth century. During this period various observations started pouring in, with scientific evidences. They were all very helpful toward solving the puzzle/s of biotechnology. Each and every contribution from different individuals helped to solve the puzzle and pave the path for new discoveries. The basics for the transfer of genetic information are the core of biotechnology. This was, for the first time, deciphered in plants, i.e., Pisum sativum, commonly known as Pea plant. These observations were decoded by Gregor John Mendel (1822-1884), an Austrian Augustinian Monk. Mendel at that time presented "Laws of Inheritance" to the Natural Science Society in Brunn, Austria. Mendel proposed that invisible internal units of information account for observable traits, and that these 'factors' -later called as genes, which are passed from one generation to the next. However, the sad part of the story is that Mendel failed to get due recognition for his discovery for almost 34 years after his death, when other scientists like Hugo de Vries, Erich Von Tschermak, and Carl Correns validated Mendel's work in 1900. The reason why Mendel's study remained unnoticed for such a long period of time was because at the same time Charles Darwin's Theory of Evolution was so consuming that it shadowed the significance of work done by Mendel. Almost at the same time Robert Brown had discovered nucleus in cells, while in 1868, Fredrich Miescher, a Swiss biologist reported nuclein, a compound that consisted of nucleic acid that he extracted from pus cells i.e., white blood cells (WBC). These two discoveries became the basis of modern molecular biology, for the discovery of DNA as a genetic material, and the role of DNA in transfer of genetic information. 1n 1881, Robert Koch, a German physician described the bacterial colonies growing on potato slices (First ever solid medium). Walter Hesse, one of the co-workers in Koch's laboratory, discovered agar when he asked his wife what kept the jelly solid even at high temperature of summer. She told, it is agar agar, since then nutrient agar became the most acceptable and useful medium to obtain pure microbial cultures as well as for their identification. In 1888, Heinrich Wilhelm Gottfried Von Waldeyer-Hartz, a German scientist coined the term 'Chromosome', which is considered as an organized structure of DNA and protein present in cells or a single piece of coiled DNA containing many genes, regulatory elements, and other nucleotide sequences. Other important discoveries during this period were vaccination against small pox and rabies developed by Edward Jenner a British Physician and Louis Pasteur a French Biologist. 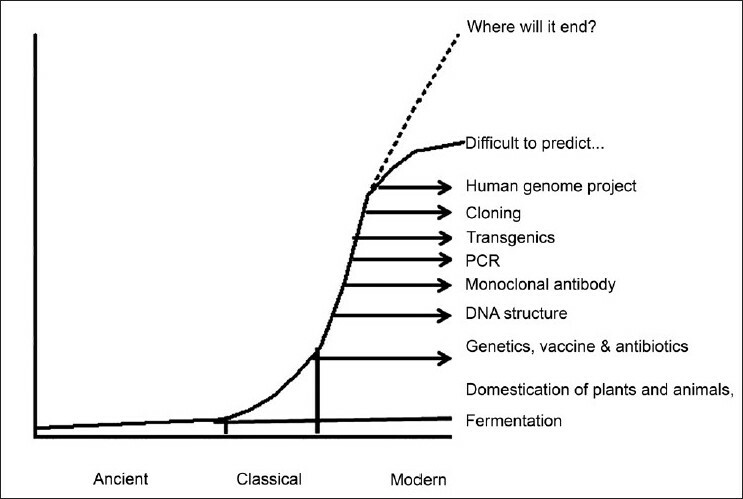 By this time the development and growth of biological sciences seemed to be reaching to the exponential phase. The principle of genetics in inheritance was redefined by T H Morgan, who has shown inheritance and the role of chromosomes in inheritance by using fruit flies, i.e., Drosophila melanogaster. This landmark work of T H Morgan was named, 'The theory of the Gene' in 1926. Before the publication of Morgan's work, in 1909, the term 'Gene' had already been coined by Wilhelm Johannsen (1857-1927), who described 'gene' as carrier of heredity. Johannsen coined the terms 'genotype' and 'phenotype'. 'Genotype' was meant to describe the genetic constitution of an organism, while 'Phenotype' was meant to describe actual organism. By this time genetics started gaining its importance, which led to the start of Eugenic Movement in USA, in 1924. As a result of this, in 1924, the US Immigration Act was used to restrict the influx of poorly educated immigrants from Southern and Eastern Europe, on the grounds of their suspected genetic inferiority. Almost at the same time, in Britain, Alexander Fleming a physician discovered antibiotics, when he observed that one microorganism can be used to kill another microorganism, a true representation of the 'divide and rule' policy of humans. Fleming noted that all bacteria (Staphylococci) died when a mold was growing in a petri-dish. Later he discovered 'penicillin' the antibacterial toxin from the mold Penicillium notatum, which could be used against many infectious diseases. Fleming wrote, "When I woke up just after dawn on September 28, 1928, I certainly didn't plan to revolutionize all medicine by discovering the world's first antibiotic, or bacteria killer". As a matter of fact vaccines and antibiotics turned out to be the best saviors of humanity. Can we attribute these two discoveries for the ever increasing population as well the ever ageing population of the world? The Second World War became a major impediment in scientific discoveries. After the end of the second world war some, very crucial discoveries were reported, which paved the path for modern biotechnology and to its current status. In 1953, JD Watson and FHC Crick for the first time cleared the mysteries around the DNA as a genetic material, by giving a structural model of DNA, popularly known as, 'Double Helix Model of DNA'. This model was able to explain various phenomena related to DNA replication, and its role in inheritance. Later, Jacob and Monad had given the concept of Operon in 1961, while Kohler and Milestein in 1975, came up with the concept of cytoplasmic hybridization and produced the first ever monoclonal antibodies, which has revolutionized the diagnostics. By this time it seemed like the world's scientific community had almost all the basic tools available to them for their applications, along with majority of basic concepts had been elucidated, which has fast forwarded the path for important scientific discoveries. Dr. Hargobind Khorana was able to synthesize the DNA in test tube, while Karl Mullis added value to Khorana's discovery by amplifying DNA in a test tube, thousand times more than the original amount of DNA. Using this technological advancement, other scientists were able to insert a foreign DNA into another host and were even able to monitor the transfer of a foreign DNA into the next generation. The advent of HIV / AIDS as a deadly disease has helped tremendously to improve various tools employed by life-scientist for discoveries and applications in various aspects of day-to-day life. In the mean time Ian Wilmut an Irish scientist was successful to clone an adult animal, using sheep as model, and he named the cloned sheep as 'Dolly'. Craig Venter, in 2000, was able to sequence the human genome; the first publically available genome is from JD Watson and Craig Venter, himself. These discoveries have unlimited implications and applications. In 2010, Craig Venter has been successful in demonstrating that a synthetic genome could replicate autonomously. Should that be considered as a new possibility for creating life in a test tube, which could be planned and designed by human being using a pen, pencil, computer, and bioinformatics as tools? In future, can we produce life as per our imagination and whims? Biotechnology has brought humanity to this level of comfort; the next question is, where will it take us? Biotechnology has both beneficial and destructive potentials. It is, WE who should decide how to use this technology to help humanity rather than to destroy it. The authors are thankful to Prof. A. K. Srivastava, DG, AIB, Amity University, Uttar Pradesh, NOIDA, India, for providing the necessary resources and facilities, for the completion of this manuscript. The authors are also grateful to Mr. Dinesh Kumar for his secretarial and graphical designing assistance.